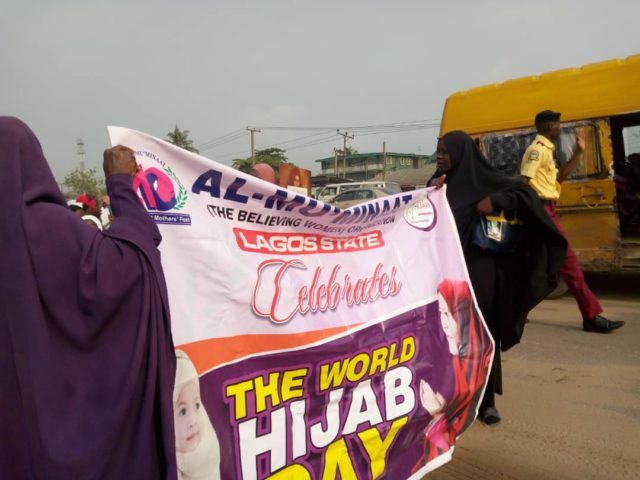 Muslim organisations in Ojo area of Lagos held a sensitisation rally on Sunday, educating Nigerians on the use of hijab. Apart from Ojo, the hijab rally also saw the hijab-wearing Muslims move from Maryland (SUBEB) to Gani Fawehinmi (Freedom) Park Ojota; and from Joju round to Sango round about. 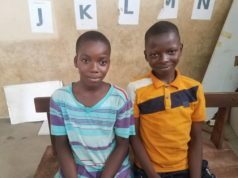 At OJo, they moved from the front gate of Adeniran Ogunsanya College of Education to Otto and ijanikin community, chanting “My Hijab… My Pride”. They shared a pamphlets discussing what hijab means and the importance of hijab to people in the community, which included both Muslims and non-Muslims. Students of Lagos State University, Adeniran Ogunsanya College of Education and Secondary Schools also participated in the rally. The women who held an awareness rally were members of Al-Mu’minaat (The Believing Women) Organisation, Federation of Muslim Women (FOMWAN), Nasrul- lahi -li Fathi Society of Nigeria (NASFAT) and the Muslim Students’ Society of Nigeria (MSSN) and Organization of Tadhamunul Muslimeen (OTM) among others. She solidarised with students facing assault, harassment and mortification because of Hijab.